While a few large companies like Johnson & Johnson got the rid of all their Mainframe-based applications and expect to run more applications in the Cloud than they currently do on their own infrastructure, the great majority of the Forbes Global 2000 organizations are still stuck at the beginning of the journey. If these large shops have initiated their move to the Cloud to reduce infrastructure costs, they'll soon be confronted with technological, cultural and psychological hurdles which may hinder them to take full advantage - cost reduction, but also business value - of the Cloud. No, the Cloud journey does't stop with the Lift & Shift of your legacy applications running on VMs. No, the Cloud shouldn't be only for new projects which will use innovative PaaS workloads for IoT, Big Data or Blockchain payments. No, the Cloud doesn't mean making your Dev work better with your Ops. Cloud is more than that - it is a disruption and a paradigm shift of both technology and culture. And those who will smartly and progressively pivot on a global scale today will be tomorrow's leaders in their respective markets and industries (see what is currently happening in Financial Services with the FinTechs). 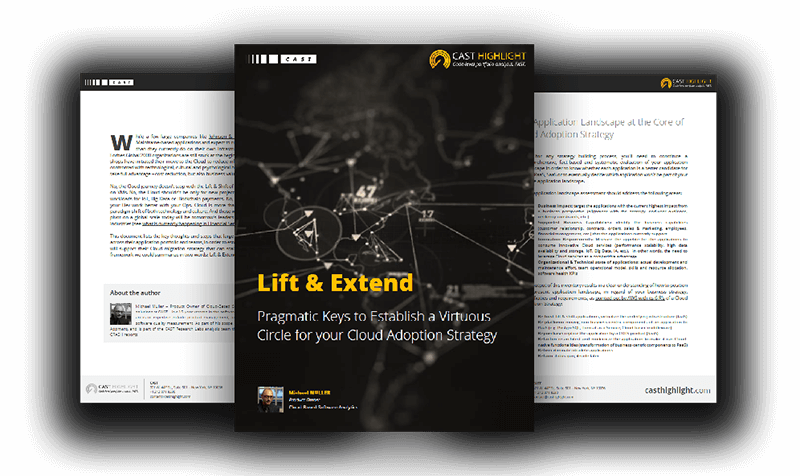 This document lists the key thoughts and steps that large organizations should implement across their application portfolio and teams, in order to establish a strong virtuous circle that will support their Cloud migration strategy that can scale globally. It's a Cloud adoption framework we could summarize in two words: Lift & Extend.